A photo from the family album of Janko Javonovic. Janko Javonovic, bus driver from Pec: I have your photographs. I took them from your house in Pec, Kosovo, after the Kosovo Liberation Army kicked you out. From the looks of it, you had no more than five minutes to leave your house. Your Albanian neighbors were taking your books, kitchen knives, children’s stuffed animals, clothes, school supplies, VCR, television, washing machine and anything else of value. What remained, they were destroying. Half of your photos lay torn up on the floor; I took the rest. When the KLA came to your door with their guns, you took money and papers and fled, leaving behind all those things one takes for granted until one has to move. The same happened to your Albanian neighbors a few months before. Marco, an ex-KLA major, took your cheap watch and a worthless bracelet that might have belonged to one of the little girls in your photo album. He was smiling, because he has a hatred for Serbs since he lost his family in Croatia. By saving your pictures, I got even, too: not with the Serbs or Albanians, but with your cursed and scarred land. I got even with the tortured and the dead, the burned and emptied villages, your burning city and the fiddling Serb and KLA politicians and warlords. I got even by doing something good, by trying to bring some goodness to Kosovo. I saved your pictures, because they will be important to you some day. I guess I could have done more, but I had come to document what I saw. I’m a photographer, and normally, I make my own pictures, but when I saw your photographs on the floor, I realized they were documents, too. By saving them, I though at least some part of the past both sides seek to erase will survive. Aren’t you a Kosovar, Janko? I’ve seen the school pictures, the family portraits, the wedding. At least, you were…. It made me feel a little better to have rescued the pictures, and as we drove out of Pec, past burned and burning houses, past a gang of young Kosovar Albanians with wooden clubs, I felt I’d done something good for Kosovo. Anyone who has picked up a gum wrapper, been kind to a stranger, helped an old man up who has fallen or performed any other tiny act of good will recognize the feeling. Fewer know how important it is to do good when the dog-worried dead lie in fields, their wrists still bound, houses still burn while the families sleep under trees, and hidden bombs and mines still kill everyone. Marco and I were called because of mines. Marco likes to de-mine houses; he does for free, and it makes him feel good. One of the Albanians thought a small device of wood and wires, hidden behind the washing machine, was a booby-trap. So one of the men sent for Marco and had him check it out. I ushered the people outside while he worked, although they wanted to watch. They do not understanding mines, that even a small one can kill or maim everyone within 15 feet. Marco worked carefully, with a mirror and flashlight, looking for trip wires, batteries, infrared trip- switches and explosives. Then he laughed, picked up the device and showed it to us. I think one of your children lost his science project from school, Janko. It’s a hand-made electrical generator … spinning the wheel lights the tiny bulb on top. Marco turned the crank and laughed, but it wasn’t silly to have been worried. In other houses, toys were made into bombs, as were lights, refrigerators and VCRs. We even heard of a booby-trapped shirt drying on a clothesline that exploded and killed the woman who took it down. Marco checked out a few more items. “Look for dust,” he said, “and scratches on the screws.” A dusty TV is safe; one without dust has been moved, possibly rigged. Black screws will show the scratches of a screwdriver. He checked under the couch, where your family stored toys and school supplies. Nothing dangerous but a dented Kalishnakov bullet, which I took. That bullet makes me wonder about you, Janko. Then I saw a shredded photograph, then another, and finally your album. I thought of what some Albanian refugees had told me, and I took it. They were refugees on a plane to Holland, and I gave away 40 Polaroid pictures that day because every family begged for a picture. When the Serbs came and drove them out … just as you had been driven out, Janko … they left behind their family photographs, and these were often all that remained of those who were killed by the Serbs or who died in the flight to the border. They have no other souvenirs but the burned shells of cement and cinder block and cement houses, the masterless wandering dogs and the thousands of corpses in bushes and fields, in shallow graves and wells, in attics and cellars. I rescued the photographs for you, a Serb, because I felt so damned terrible about what I had seen outside your house and what I was seeing inside, as your hurt, angry and vengeful neighbors milled around me. I tried to do something good, to disperse the feeling of evil that hung in a sticky, stinging chemical cloud, like the smoke from burning plastic or overheated chili peppers. This is strange justice, to be sure. Kosovo is strewn with photographs. Wherever the Serbs attacked, the fires and flight scattered pictures in ditches, gutters and fields, and only the journalists who came in June have stopped to pick them up, to ask to whom they belong and whom they depict. These pictures in the gutters look just like yours: family portraits, wedding snapshots, grandma and grandchildren, vacation at the beach, the children, a shop, a friend or two. You will get your pictures back someday. If you are still alive. I hope they will bring some joy back to an unhappy land. If they bring only bitterness to you, or more rage, then to hell with you: They were never for you alone. 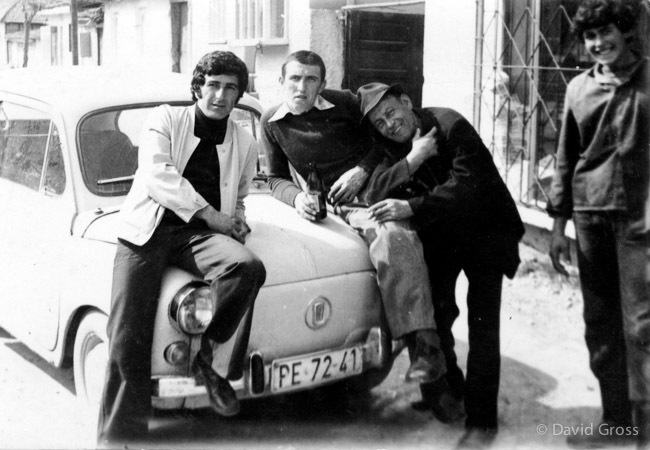 Epilogue: On a later trip to Kosovo, I found some Serbs who knew Mr. Javonovic. I gave the album to them, and they promised to return it to him in Serbia.